Streaming home games is becoming increasingly popular, especially when groups are already playing online using virtual tabletops. Recording sessions can help both the players and the DM recall details between games, share their games with friends, and even has the potential to provide a little side income just for playing the game you love. Organize the chaos of VTT interfaces with an overlay. Meant for use with streaming software (such as XSplit), this pack comes with a few variants for the needs of your group. If there's a variant you'd like to see, leave a comment and I will see about adding it to the pack as well! Looking for something a little more classic? Check out the Wood Panels Twitch Overlay! Hi! Are you still taking requests for possible variants? Sure thing! It might take me a bit to get to it, but I am happy to take requests for variant versions. These are really nice! We are a non-profit charity and have someone that creates ours, but I like the layout you created. Would like to discuss using them in conjunction with ours if possible. Thank you so much! I am terribly sorry for the late response - I thought I was supposed to be getting notifications when someone comments. If you'd still like to chat, you can reach me at chilbigart@gmail.com. Have you got any experience with Roll20 overlays? I am a local Twitch streamer, dedicated to live RPG shows and would rather work and promote local talent on my channel. I don't have experience specifically with Roll20. 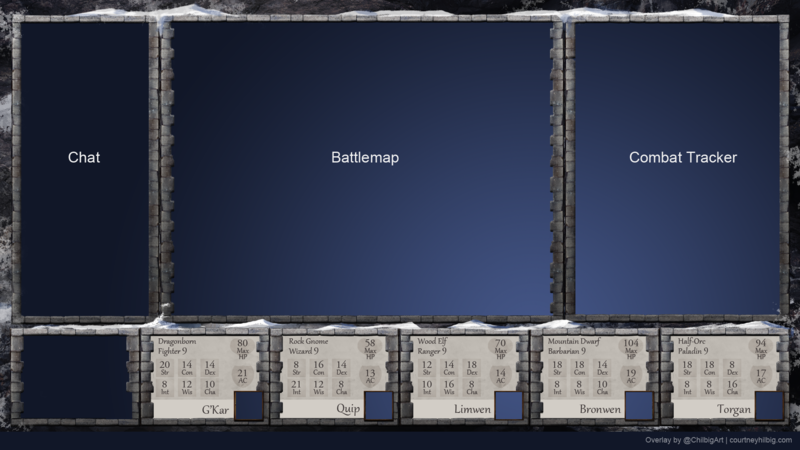 These overlays were made with Fantasy Grounds in mind (as that's what my group plays with) but I imagine the principle is much the same. Is there something specific that you're looking for?